Hundreds of couples thronged roads leading to Nyamirama Secondary School playground where they made the ‘until death do us apart’ vow in a mass-wedding ceremony. “We couldn’t wait any more,” said Jean Habumuremyi, one of the 520 couples that tied the knot in Nyamirama Sector, Kayonza District yesterday. smart, some with roses, and were all smiles. After the ceremony which was conducted by the sector leader, the group left in pairs to celebrate the day with families and friends. 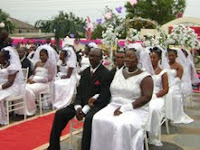 Nyamirama Sector becomes the first sector in the district to hold such a mass wedding. Andre Twamugabo, the Executive Secretary of the sector, said the event was a milestone in the area. He said that the programme was intended to help poor people in the community who cannot afford dowry or cannot afford the expenses of marriage and feasts to get married legally. “We are set to break the record with 720 more marriages soon. The couples have started seeking marriages due to the advantages that come with being legally married”. The Executive Secretary noted that legal marriages will help address domestic conflicts and violence. “Legal marriage gives women and children rights on property...many men had turned polygamous because they never had legal marriage,” he said. Jeanine Musabyemariya, 56, said that legal marriage makes women comfortable and more assured in their homes as wives.